This 28ft Custom Express fishing out of Los Sueños Marina in Playa Herradura has been called ‘the biggest little boat around’. Powered by twin Cummins 4BT inboard diesels, with a cruising speed of 20 knots, she has experienced bilingual Captain Carlos Arguedas at the helm, along with mate Canario. She has lots of sitting room and shade, a forward cabin with V-berth and Vaccuflush toilet; fresh and salt water wash-down pumps; custom upper and lower stations with Furuno Navnet plotter sounder radar, single-lever Kobelt controls, 6KW Furuno radar and two Icom VHF radios. She carries all Shimano fishing tackle and Precision electric teaser reels. 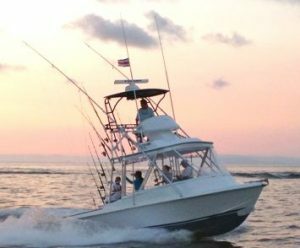 Other features include a custom center cockpit live well with six tuna tubes with dual Rule 3700 gallon per hour pumps, plus a backup Sureflow live well pump and all USCG safety equipment.